There are a few topics which we’ll cover and the ‘News’ section at the bottom will be updated whenever there is new information or anything we think may be of use. For those of you who don’t know, the eastern third of Camber Sands beach is having its sea defences updated and upgraded. The groynes which have served for numerous years from the Suttons Houses to the army range have been deemed unsustainable and the risk of flooding isn’t acceptable. Until 2014 the Environment Agency recharged these with quarried shingle / stone every spring which took around 3 months after the winter storms at the cost of around £1 million a year. Until around 8 years ago the shingle came from Dungeness (which is where it gets washed away to due to the currents and long shore drift from the west to east) but this was banned due to Dungeness being a nature reserve and in a ‘Site of Special Scientific Interest’. This ban is the reason the new sea defence designs began due to the unsustainable alternative of having to quarry the thousands of tonnes of rock each year. You may have noticed the stones on the beach are sharper than in the past due to this. 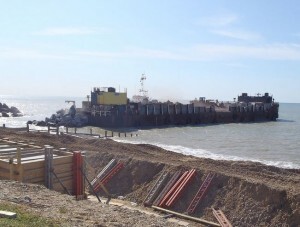 There has been a lot of support from local home and business owners for the new more secure sea defence which is the start of a much larger project spanning the coast from Rye Harbour to Hythe. The renewed defences are so important because Romney Marsh, the flat land behind the beach which was reclaimed from the sea 1600s is almost all at or below sea level. So a breach to any part of the coast would put 14,000 homes and many businesses in real danger. The scheme has been on the cards for almost 7 years and we’ve been involved in the design process since 2009, giving feedback on how the beach is used, at what tide state, the kind of numbers who visit regularly, things we’d like to see changed, etc: We’ve sat through more meetings than I can remember but this will hopefully have a positive effect when it’s finished. The Environment Agency have tried to build in as many of our requests as they can while keeping within legislation and budget. The £30 million Broomhill Sands coastal defence scheme is part of the Folkestone to Cliff End Strategy which, once complete, will reduce flood risk for 14,500 homes, numerous businesses, a nuclear power station, significant areas of designated habitat and 2 Ministry of Defence firing ranges. 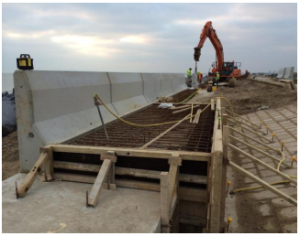 The Broomhill Sands coastal defence scheme is located between Camber and Jury’s Gap and the scheme here will directly protect approximately 1,300 homes and over 100 businesses. It will increase the standard of protection to the area from 1 in 20 years to 1 in 200 years, taking into account predicted sea level rises. To add to the above we’ve included a map with text to show what is happening and where. The promenade and wave wall will run behind the rock revetment and join the current promenade which stretches from the car park to the Suttons houses. If finished smoothly it could be a great 2.4km stretch for longboarding! The access steps will be at least 3m wide to allow the carrying of equipment and are made of timber with a non slip finish even when wet. Our thoughts: I’m sure most of you are the similar to us and really aren’t too bothered about how it is built, what materials are used or what it’s even for. The biggest questions is how it will effect the beach both this summer and in the future?! When we initially saw the designs for the rock revetment our thoughts were ‘this is a deathtrap’. However, since the first stages of the build have been completed we’ve been really impressed with the finish. The rocks are laid in an almost patio like layout, positioned carefully and are very level with one another due to being quarried with dynamite and having flat sides. The visible part of the revetment is only at the very top of the shingle bank (probably 7 – 8m) before diving deep underground and under the shingle bank down to the high tide line. This is brilliant news as the area of the beach where everyone uses to set up kites or launch and land if kiting at high tide is still shingle and always will be. 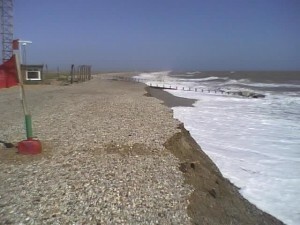 The overall height of the shingle bank is also higher which means the tide won’t come up as far. 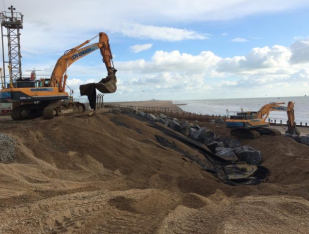 Our biggest worry at the start of the project was that there would be no space when the tide is high and if the rocks were placed all the way down the shingle bank would be a much bigger safety concern, so this development is of great relief. The steps are at regular intervals and we think will actually make access to the beach easier as sometimes in the past it’s like a cliff drop! The steps are built at 3m wide so equipment can be carried or dragged up and down easily. A promenade will run along the entire sea defence and there are going to be some wind protected seating areas made from the old groynes for people to watch which should be quite nice. 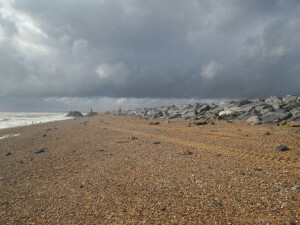 Any of the smaller rocks mixed among the shingle visible in this photo will be removed before any section of the beach is opened again to the public. What wasn’t explained in previous meetings or designs was that the bottom half (from the middle of the current shingle bank into the sea) of the original groynes are staying in place. There is be a gap between the groynes and the rock revetment (at the top of the shingle bank) which should be great for setting up kites and laying out lines while waiting for the tide to go down. Keeping the original groynes in place is actually a big positive even if it doesn’t sound like it, as it will give the beach stability and help build up the shingle in front of the rock revetment which in turn will build up the sand banks used for buggying and landboarding. The new groynes up by the Suttons will be replenished (now and in the future) with shingle which will inevitably find its way further east, feeding onto the rock revetment helping to cover it further. The Environment Agency has conducted water tank tests with model sea defences constructed to show the effect on the beach and the results have been good. The sand banks stay as they are or even increase slightly with good stability throughout. If anyone has been to the beach recently its clear that the defence is already having an effect on the banks as they are enormous, the sand is as high as we have seen for many years which is not only good for the land based sports but also jacks up the waves for anyone looking to surf – long may it continue! This video shows the beautiful beach to begin with but the part built sea defence in the second half. The rock boulders are a bit random in their placement on the beach as they have been delivered from the barge and are yet to be placed, but it shows the rocks in their final position at the top of the bank downwind from the parked diggers and the section of groynes which are left in place for the future. This is an approximate schedule, some parts have been ahead and some have been slightly behind but so far the contractors have been accurate. The planning permission for the building works stipulates that there must be access at all times and a certain amount of the beach has to be open to the public, so as one phase begins another is competed and opens up again. This will mean we can always get down to the beach. The contractors have so far kept much more of the beach open then the planning requires and we believe will keep doing so. The video above shows that the works are only really around the high tide mark. As the tide goes out and sand shows more of the beach will be open to kitesurfers and once on the water the restrictions don’t really apply. We’re waiting for maps to be printed and posted around the car park marking which areas are currently safe and accessible, we’ll keep this updated whenever they are changed. There is currently safe access to the beach through a break in the fence in front of the centre, this is open 24 / 7. Should access here be closed at any point another entry to the beach will be available from the car park. Building work is only from Monday to Friday – at the weekends the machinery is parked off the beach. The Project Manager from Van Ord (the contractors) is a kitesurfer so understands how the beach works. He has been really good at keeping the beach open as much as possible so far and I’m sure will continue to do so throughout the building process. The kite zone will be the same as always, which is from the end of the car park at the western side (where the flag pole used to be) down to the army range marked with a red flag at the eastern end. If the red flag is not flying the zone extends right down to Dungeness. This really isn’t utilised by many people but worth noting on busy weekends as the beach is more than 6 miles long and the army range are rarely firing. Due to the works and the access needed to the beach by the machinery the car park has been split down the middle resulting in less parking space. The current condition of the car park is bad firstly because it has been very wet, secondly because a large amount of traffic is now using the same area and the car park has had no maintenance work for over 3 years. We’ve managed to convince the council and Environment Agency to work on the area in use before the Easter holidays. This will at least mean that the whole current car park is usable but please be considerate – there will be limited space this summer so park sensibly. We estimate it can still hold over 150 cars which should accommodate us all on a windy day. 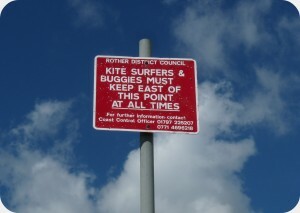 We’re hoping the building works and more limited parking space will keep other beach users out of the kite and watersports zone. Over the past few years it has become busier and busier with general beach users due to it being the only free car park in Camber. We along with the council have explored local alternatives for parking but are yet to find a willing land owner. Once the sea defence is finished we will get the rest of our car park back. It won’t be quite as large as before due to the promenade but it will be plenty big enough. There will be disabled parking spaces with access ramps onto the promenade near to where the centre is which will probably make excellent access for buggies. We have campaigned long and hard to get a public toilet in the car park but to date have had no luck which is why we use a portaloo for our customers. The Environment Agency’s building budget won’t cover car park maintenance such as tarmacing or toilets so it’s down to the local council, who have no budget for building but more importantly the cleaning and maintaining of toilets. The other toilets in the car parks at Camber are cleaned twice a day so this does get expensive. We are currently in contact with the District Council to see if they can provide anything or at least contribute. The local council don’t plan to charge for the car park and never have done which is almost part of the problem. We’ll keep this section up to date every two weeks when we receive the newsletter from the Environment Agency or if we have any feedback from site meetings with the contractors. The beach is currently fully open at high tide from the western end of the kite zone to the ship wreck. As the tide goes out the whole beach is available but there are coned off sections around the rock piles towards the army range end of the beach. Be careful of these as they can be unstable so give them plenty of space. 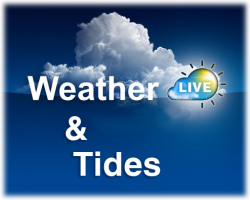 If the tide is coming in and you feel you can’t stay up wind then walk back upwind before the tide gets too close to them. The rock piles sit on the beach between where the base of the shingle bank hits the sea and the sand bank so are only a problem when the tide is higher (see video above). At low mid or low tide there aren’t any obstructions along the beach and there are unlikely to be any throughout the build. 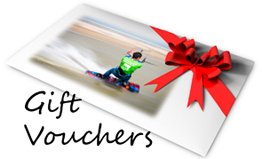 The latest newsletter from the EA…. Apologies for the slight delay in providing this sixth progress update from the Broomhill Sands team – we’ve had a very busy few weeks on site. You’ll notice there is now a lot more shingle up by the Suttons houses. The majority of this is now in place but there will be a small amount more to move towards the end of the build. This seems like a good setting up area when the tide is high as it’s huge! There is now 90% of the main promenade in place and the constructors are working on the final finish which will be a much smoother surface so as more comfortable to walk on bare foot. This will be complete in the next couple of weeks and we’re hoping will be good for long boarding and skateboarding along! Almost all the rock is in place now. The last shipment is now here and there are still large piles on the beach but they will be place as soon as the steps to the beach are finished. We’re pushing hard to have the beach completely cleared once the project is finished to remove any dangerous objects. A lot of the old groynes have now been removed giving us a lot more space for setting up when launching and landing. The sand banks appear to have settled a lot higher than the spring so we’re quietly confident the beach will stay as it was previously and remain good for kitesurfing and kite buggying. Fortunately the works are almost over and disruption to the beach is reducing daily.